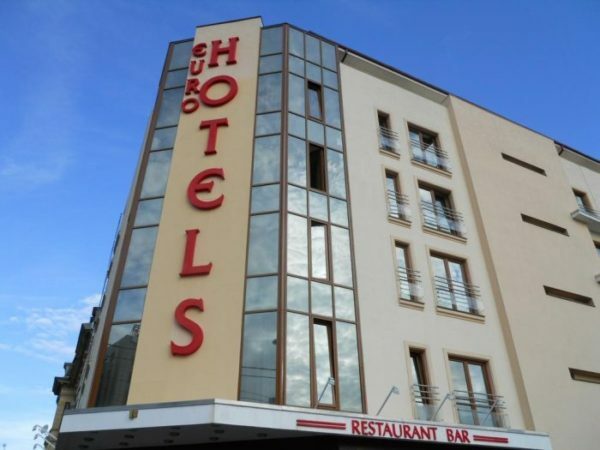 If you’re planning to visit Bucharest and you want to be close to the train station – Gara de Nord – you have some very good hotels to choose from for your accommodation. And today, we’re going to talk exactly about this: the best hotels in Bucharest close to the Gara de Nord train station. The good news about Gara de Nord is that it’s conveniently located very close to the city center. So, by choosing a hotel close to it, you’re just minutes away from the city’s central attractions and also close to the train station itself in case you need to be there quickly for a train ride. The prices of these hotels are also really good, as you have some solid budget options that are just a stone’s throw away from Gara de Nord. I’ve also included a bit more expensive options that offer more goodies too – so you definitely have alternatives. In case it’s not the train station you want to be very close to, I’ve also written an article on the best hotels close to the Bucharest Airport, as well as one listing my top choices in the city center. 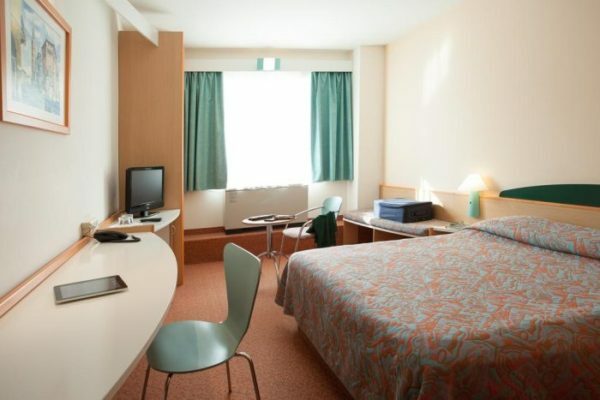 We’re starting with an extremely cheap hotel that is within walking distance to Gara de Nord. In just a few minutes of walking, you’re at the reception so there’s really no need to worry on how to get there. It’s also conveniently located just near the Gara de Nord metro station that can take you anywhere in the city and do it fast. This is a two star hotel, but it’s quality is really high for the amount of stars it has, so don’t be discouraged by that if you’re on a budget! However, the rooms are pretty small and if you value your privacy a lot and you’re not traveling alone… you might have a problem here. In order to optimize space as much as possible, the bathroom is actually part of the main room, so you basically have the sink, shower and toilet in the same room where you sleep. It’s true that the latter two are separated by glass walls, but there’s still not a lot of privacy left to enjoy. But if you can get past this little problem, you’re up for a really good deal here: the staff is incredibly friendly and helpful, the rooms themselves are very clean and even the food that the hotel serves is good, so you can get the breakfast buffet without worries if you decide to book your stay here. There are still a ton of options when it comes to eating out in the vicinity of the hotel, though and the city center is very close via metro, buses or taxi, so you won’t have any reasons to worry. And if you want proximity to Gara de Nord, you’re right there next to it! This one’s a bit farther away from the train station, but easily accessible by bus. You can even walk to it if you’re not carrying a lot of luggage and you don’t mind walking for about 10-15 minutes, depending on your own pace. This is a very small hotel located on a very quiet street and glued to a very cheap restaurant where you will definitely enjoy the food. Which is very good, because the hotel itself doesn’t have a restaurant! But it does offer a kitchen with a microwave oven, so you’re still covered if you don’t want to eat at any of the nearby restaurants. Being a 3 star hotel, it offers better quality rooms while keeping the prices very low. 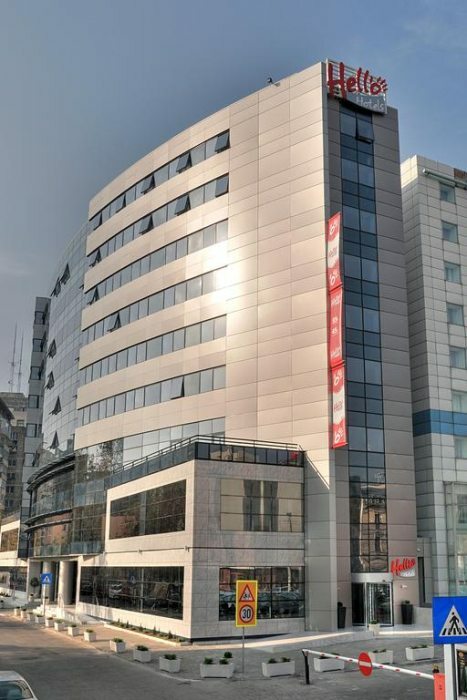 Combining that with the fact that it’s almost centrally located, you actually get a really good deal from Ave Hotel Victoriei and you’re still close to the train station. The rooms are decently sized and the furniture is new and clean, with Ikea-type furniture and nice decorations to make you feel as welcome as possible. Some rooms have an electric fireplace that makes things look even better, while other rooms have a Jacuzzi in the bathroom. So if you don’t mind not being right next to the train station, you’re getting a really good deal from this hotel! 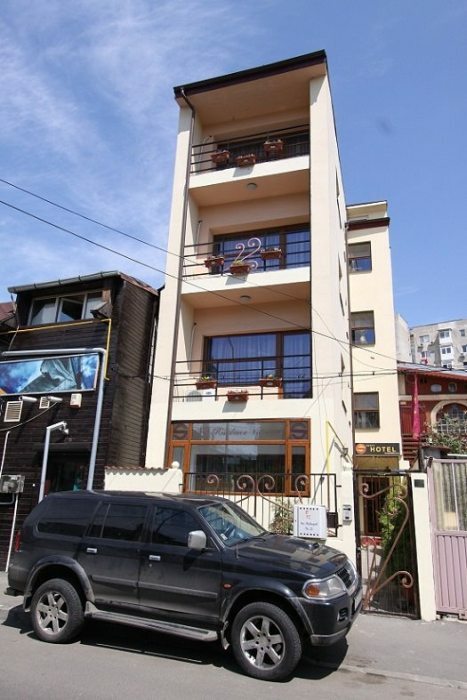 This is the hotel that the family that moved from the US to Brasov chose when they arrived in Romania, and they have chosen it as their hotel again when they visited Bucharest, so they were definitely happy with it. And I’m sure anybody would! It’s right next to Hello Hotels, but is rated at 3 stars and offers much better overall quality. 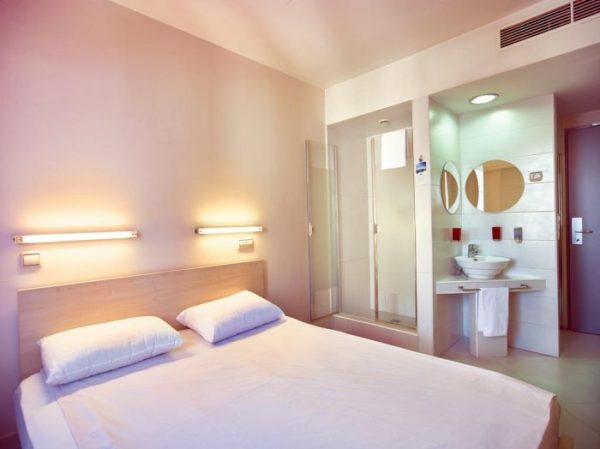 It’s also just a stone’s throw away from the train station and right in front of the Gara de Nord metro station itself, so you can’t get a better location than this! This is a large hotel and it’s extremely popular, but the staff still manage to keep it clean and in perfect condition. 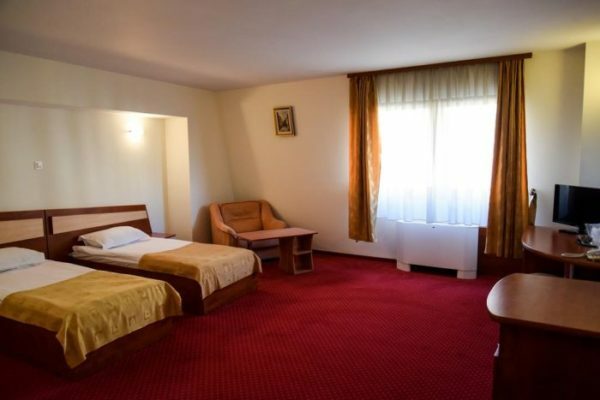 There are many foreign people staying here, so the quality has to be a bit higher than your regular Romanian hotel. I personally liked the large beds there and the colors of the rooms. The staff speak flawless English and the hotel itself is pet friendly, which is a really rare find (and great news if you travel with pets). There’s also a restaurant and a bar in the hotel, but the food itself is not exceptional. It is high quality and very convenient to get breakfast too, but don’t expect anything out of the ordinary. Don’t expect to leave the room hungry either! 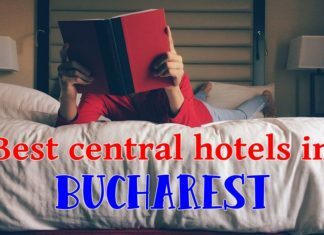 All in all, if you’re looking for something right near the train station, a place that has been tested and appreciated by lots of foreign travelers, as well as one that I highly recommend, look no further and choose this hotel for your stay in Bucharest if you want to be close to Gara de Nord! 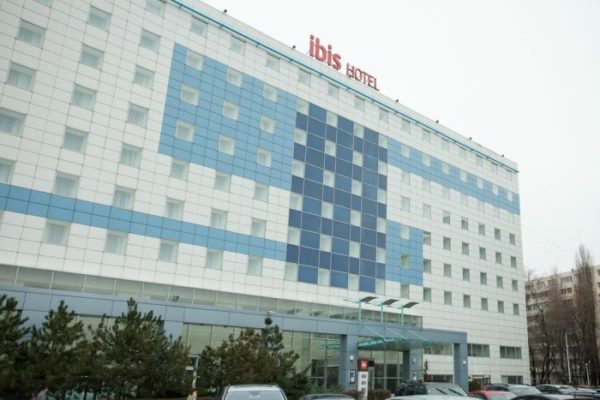 Right across the street from ibis and Hello Hotels, we have Euro Hotels – another great choice if you want to be right there when your train leaves (or arrives). Plus, it’s low price becomes even better when you take into consideration the fact that a buffet breakfast is included in the price. The food is also decent and you’ll always find something to eat and enjoy. I always prefer to book places that give me the chance to eat breakfast as I never skip one and I also never feel like getting out of the hotel searching for a place to eat something. So if you’re like me, you’ll really appreciate the included breakfast. 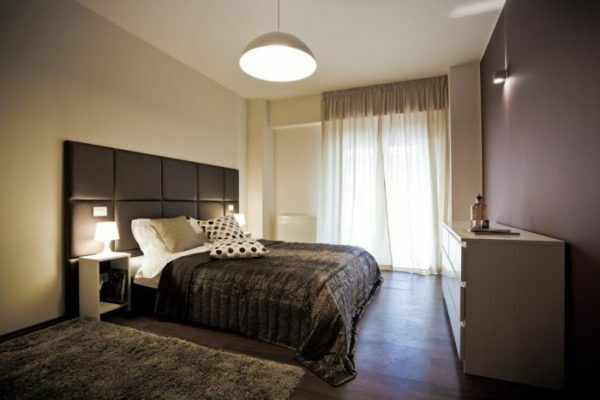 But even if you don’t, you will surely appreciate the large rooms with very comfortable mattresses. The rooms themselves are clean and the hotel itself is slightly better rated by travelers on Booking.com – so you know you’re in for a sweet deal if you choose it as your place to stay when in Bucharest. 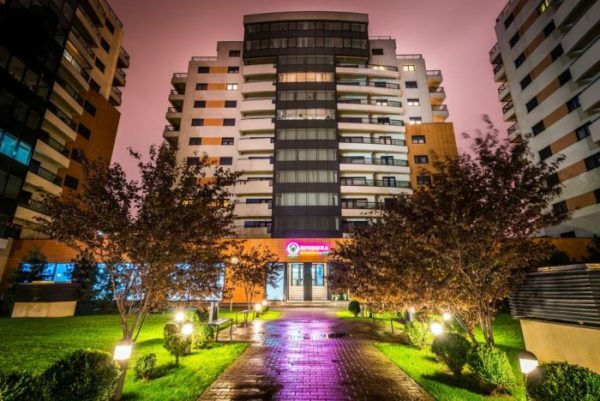 This is one of the top picks in Bucharest by Booking.com’s travelers and an amazing option if you want a bit of luxury during your stay in Romania’s capital city. Because, yes, we’re talking about a really good 4 star hotel that offers accommodation in beautiful apartments. While still close to the train station, it is the farthest away on our list – but it’s really worth it if you have the budget for it. It’s also one of the largest and best aparthotels in Bucharest and the only CO2 neutral hotel in Romania, so if you’re a nature lover, you don’t have to worry about the impact your stay will have on CO2 emissions. Either way, we should say that the apartments offered here are really huge and delightful. Some offer a kitchenette with an oven, while others come with a terrace or balcony offering great views over the city. 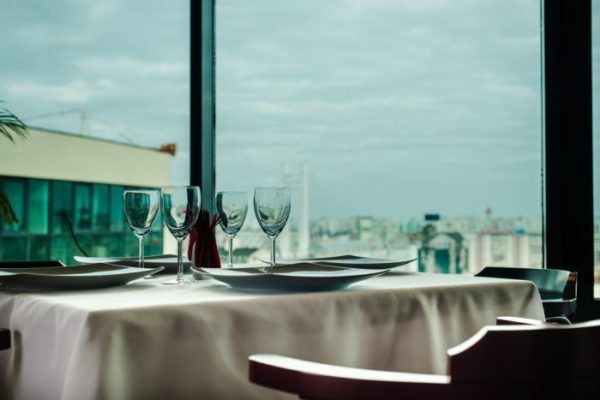 The hotel’s restaurant itself offers some great views over the city as well! 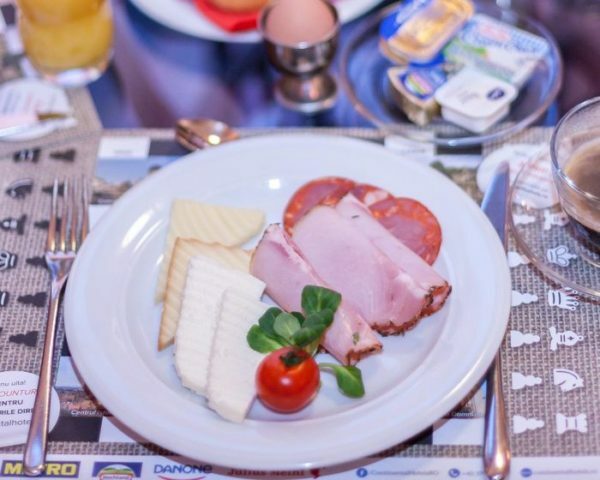 And since we’re talking about the restaurant, I should mention that there’s a really good breakfast included in the price – one that I am sure everybody will enjoy. The food here is absolutely yummy and you risk getting back home with a few extra pounds. But the hotel itself has a great spa on site, with a really nice indoor pool available for its guests (make sure you choose a room with Spa access when you book your stay!) There’s massage there, hamam, a nice gym and even a salt room. In other words, you have a lot of things to do to enjoy your stay in Bucharest without getting out of the hotel! And the rooms themselves offer a real treat as well! They are large, clean, decorated with taste and you’ll feel just like home if you stay here. It is true, it’s pricier than the other hotels on our list, but if you can afford it, it’s the better pick for sure! There you have them: quite a few options when it comes to choosing your hotel near the train station in Bucharest. Pick whichever fits your budget and you’ll surely have a great stay here! What, no Hiltons??? Ha, ha! in Bucharest–but in general in Romania? There’s Hilton too, but not close to the train station and not too friendly for the budget either. As for the longer stays, I think that the best bet is AirBnb as you usually get to interact with your host as well and get some valuable advice from a local. And yes, whenever I get to Bucharest I am staying with my mother in law so that works very well cost-wise. The residence and spa looks great, as does the Hello hotel. It would definitely be convenient as the train station takes you everywhere in the country. We used it to get to Peles castle with you and of course our weekend getaway to Brasov was also from there. It’s funny how so many places name their train stations North. Ours is Estacion Nord here too. the recent spate of cold weather! they needed for the season. write a piece to let us know how his time in Romania is going? Isn’t just like politicians to sneak one in? At least you don’t have Trump, so count your blessings! Sorry for taking so long to answer. Our son brought back a virus from kindergarten, one that kept us in bed for a while 🙂 Regarding the date for joining the Euro… it still doesn’t mean that it will actually happen. They can and most likely will change their mind by 2024. Sorry to hear about the virus. I know they spread quite quickly. Ah, you’re so optimistic about Euro–ha, ha! Get well Father, Wife, and Son Romanian!